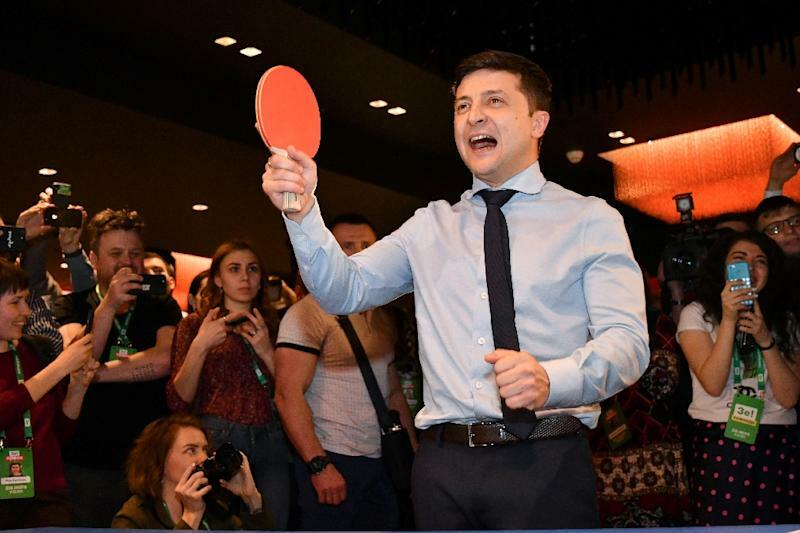 Kryvyi Rig (Ukraine) (AFP) - In his startling run to become Ukraine's next president, comedian Volodymyr Zelensky has enjoyed a key advantage over his rivals: strong support from the country's Russian-speaking regions. Despite vowing to keep Ukraine on a pro-Western course, Zelensky has polled particularly well in areas of the country where Russian speakers make up large parts of the population. Most people in the country can speak both Ukrainian and Russian, though regions in the south and east -- and some in the centre -- are predominantly Russian-speaking and have traditionally backed Kremlin-friendly candidates. A popular uprising in Ukraine forced a Moscow-backed regime out of office in 2014. Since then Moscow has annexed Crimea and Kiev's forces are locked in conflict with separatists supported by Russia in the east of Ukraine. The fighting there has cost some 13,000 lives so far. Zelensky's bid for the leadership started out as a long shot but he leapfrogged establishment candidates amid public frustration over the ongoing conflict, as well as corruption and a struggling economy. "Those in power now just don't work for me at all, we need to change them," Olga Shulyatieva, a 42-year-old saleswoman, said in the kitchen of her Kryvyi Rig flat. "The promises they made were not kept." The mother of three blamed Poroshenko for "poverty and a fall in living standards" in the nation of some 45 million people. She said she wanted a "normal life" for her children and for them to be able to work and study in their own country. Shulyatieva's husband is working in Brazil and one of her daughters is preparing to study in Poland. Andriy Bychenko, an analyst at the Razumkov Centre think-tank in Kiev, said the fact Zelensky is a native Russian speaker plays well in those regions but it is not a key factor. "There are people (in Russian-speaking areas) who don't want a rapprochement with Russia but feel closer to Zelensky because he's a Russophone," he said. According to a recent survey, Zelensky's supporters are fans of his personality rather than his policy positions. He has remained vague on the ways he would tackle the most serious crisis to hit Ukraine since it gained independence in 1991. Shulyatieva said his lack of political experience would not put her off voting for him. "He'll get all that experience in a year. He'll have a group of people around him to support him."